World Cinema Paradise | Blu-ray Review Round-Up: Films by Robert Bresson, Karel Zeman, the Coen Brothers & more! Accepting the mystery is key to the enjoyment of Barton Fink, which feels like the first instance of the Coens fully operating on that mysterious, metaphysical level. Though Barton and Charlie strike up a kind of friendship, their conversations are never operating on the same plane. Goodman’s cackling enthusiasm is tough to pin down — Is he sincere? Does he have nefarious intentions? — but Turturro is a self-serving blank slate, only hearing what he wants to and interpreting it accordingly. The disconnect between Barton’s grand pronouncements and his actions is textbook literary irony — and in the Coens’ hands, great fodder for comedy! — but Barton Fink is much weirder than that, veering from fast-paced screwball antics (thanks to a great Michael Lerner) to gut-churning existential dread to quite-real physical terror, culminating in one of their signature bemused non-sequitur finishes. It’s great. Accept the mystery. 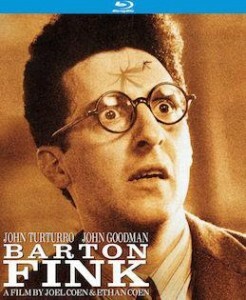 Barton Fink has received a number of Blu-ray releases in Europe, where Universal holds the rights, and like many Universal catalog titles, that one is afflicted with some heavy-handed digital manipulation. Kino’s Fox-provided 1080p, 1.66:1 transfer (the case’s listing of 2.35:1 is a typo) doesn’t have that issue; this appears to be a fairly hands-off transfer of a somewhat dated master — a fair amount of speckling and a few more obtrusive marks are present. Overall, this is a decent improvement, offering reasonable levels of fine detail, stable if muted colors and nicely resolved film grain. The image isn’t tack-sharp, particularly in extreme detail close-ups that can really reveal a softness that’s somewhat pervasive, and low-light scenes have a tendency to look a touch washed-out. Still, it’s an easy upgrade over all other available versions. (The US DVD is almost unbelievably bad.) The 2.0 DTS-HD Master Audio soundtrack is excellent, giving the sound design’s crescendos some real heft. For some time, Criterion was expected to pick up the rights to Barton Fink, but Kino has assembled a supplements package that looks a lot like what Criterion may have done. Four new interviews are included on the disc, including a subdued Turturro, who mostly does some personal reminiscing and a riotous Lerner, who smokes a cigar and is nearly as boisterous as his character, more than 25 years later. An interview with producer Ben Barenholtz and a featurette on the film’s sound, with composer Carter Burwell and sound editor Skip Lievsay are also included. Carried over from the DVD: eight deleted/extended scenes, looking a little less rough here, and the theatrical trailer. The final film in one of the most tightly focused cinematic careers you could hope to find, L’Argent is one last masterpiece among many in Robert Bresson’s oeuvre. Some filmmakers go out with a gut punch (say, in a very different vein of filmmaking, Sidney Lumet’s Before the Devil Knows You’re Dead), and Bresson delivers a profoundly disquieting one. The emotions are so sublimated in a Bresson film, it can take some time to work out one’s own emotional response, but I’m not sure any (aside from possibly Lancelot du Lac) have left me cold, and L’Argent is the kind of film that imprints its mysteries on your brain. 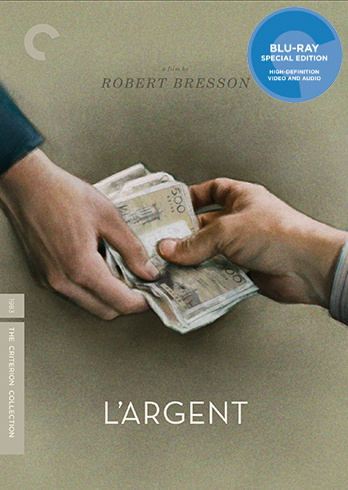 As Adrian Martin notes in his excellent essay included with Criterion’s new Blu-ray release, L’Argent sees Bresson once again using ostensible genre trappings, like in Pickpocket and A Man Escaped. Here, the conceit starts out following a “butterfly effect” pattern, where a couple of schoolkids’ decision to pass a counterfeit bill results in a cascading series of increasingly consequential events, including robberies and eventually, murder. In the beginning, the film is almost propulsive in its movement from one incident to the next, from the initial payment to a knowingly shady payout to Yvon (Christian Patey), the truck driver fated to feel the brunt of the film’s depiction of ruthless capitalism, where a transactional society offers little respite for the soul. But the film’s moments begin to elongate, less ruled by their own connection to previous events and more by the caprices of modern life, which are as initially unknowable here as they typically are in Bresson. This culminates in a final sequence where Yvon is taken in by a woman whose kindness seems like it may be just a factor of her resignation (Sylvie Van den Elsen). Ruthless in its implications, this is a finale governed by a deeply unsettling rhythm. Violence hovers outside the frame, like in an extraordinary moment involving a coffee cup. This extends to the film’s final act of violence, drained of graphic detail, but felt in all of its hopeless inevitability. Criterion’s 1080p, 1.66:1 transfer is sourced from a new 2K restoration scanned at 4K resolution by MK2 at Éclair Laboratories. Like a number of recent French restorations, including Alain Resnais’ Je t’aime, Je t’aime and Muriel, this one will raise some concerns with its color timing, which definitely leans in a sickly yellowish/teal-ish direction. The quality of the restoration is otherwise excellent, with richly detailed images and perfectly rendered film grain. The 1.0 LPCM mono track handles the film’s dialogue and music just fine. Though there aren’t a ton of extras (let’s hope Criterion is apportioning some for later Bresson releases; rescuing Une femme douce and Four Nights of a Dreamer from their rights entanglements would be heroic), what we do get is welcome. Footage from the contentious press conference at the 1983 Cannes Film Festival is included, along with a new visual essay from James Quandt, who goes A-Z through a list of Bresson traits. The format is a tiny bit gimmicky, but the analysis is great, offering a wide-ranging primer on the inner workings of a Bresson film. The theatrical trailer, which consists only of shots of ATMs dispensing money, is also included. The hefty booklet includes the aforementioned Martin essay and a 1983 interview with Bresson by Michel Ciment. If I’m ever in the mood to head down a cinematic rabbit hole, grabbing something I’m not familiar with from Second Run off the shelf is almost always a perfect starting point. That’s certainly the case with their latest Blu-ray release, The Fabulous Baron Munchausen, from Czech filmmaker Karel Zeman. Occupying a crucial point in the connective tissue between the tactile fantasy of Georges Méliès, Ray Harryhausen, Alexander Korda’s The Thief of Bagdad, Terry Gilliam and Henry Selick, The Fabulous Baron Munchausen offers moment after moment of highly concentrated joy. The technical marvels in this animation/live action hybrid are myriad, from the way Zeman creates spatial depth through use of elaborate cutouts to the quality of the animation itself, often somewhere right in the middle of whimsical and unsettling (the through-line to Gilliam, who of course made his own Munchausen film, is at its clearest here). The narrative approach to the well-worn Munchausen mythos is pure picaresque, hurtling from the moon to a Turkish kingdom to the depths of the ocean, as the good-naturedly pompous Munchausen (Miloš Kopecký) offers an astronaut (Rudolf Jelínek) a tour of Earth after mistaking him for a resident of the moon. Various hostile actors, from a sultan to a massive fish, threaten their adventures, but Munchausen’s primary concern is wooing away a princess (Jana Brejchová) from the astronaut after they help her escape from the Turkish kingdom. Zeman’s conception of Munchausen as a somewhat delusional but ultimately well-meaning figure informs the film’s tone: dryly satirical with numerous flights of fancy and a romantic soul. It’s a tone I’ve never seen pulled off quite like this before. Second Run’s region-free Blu-ray release features a 1080p, 1.37:1 transfer sourced from a new 4K restoration. This is a strong contender for the best-looking disc Second Run has ever released, with incredible levels of detail visible in each frame. Zeman’s colors are kind of mind-bending, and the burnished golds and rich blues look amazing here. The 2.0 mono LPCM sound track is clean and precise. This is also a strong performer in the extras department, with two new major supplements. 2015 feature-length documentary Film Adventurer Karel Zeman offers a comprehensive look at the filmmaker’s career, while Michael Brooke’s appreciation features a thorough rundown of Munchausen’s representation in cinema alongside an analysis of Zeman’s version. Carried over from a previous DVD edition are a number of featurettes on the film’s production. A booklet includes an essay from Graham Williamson. “It’s almost Dalí,” reads the pull-quote on the cover of Kino’s new Blu-ray of Who’s Crazy?, a rediscovered curio from 1966. From anyone other than its source, that would seem like an eye-rollingly reductive way to describe a free-form experimental film. From Salvador Dalí himself, it’s impossible to resist. There’s a pretty big gap in that “almost” though; Who’s Crazy? isn’t so much surreal as it is wildly fragmented. Starring members of New York’s now-venerable Living Theatre, the film strings together extended scenes of anarchy on a very slender narrative thread: a group of patients from a mental hospital escape their bus and flee to an empty farmhouse, where a power struggle ensues. The film is sort of like watching an acting troupe organize their warmup exercises around a half-remembered viewing of The Exterminating Angel. A bunch of people are trapped in a house and they behave erratically. The similarities don’t continue; there’s plenty of food, as captured in a scene where enormous amounts of eggs are cooked. There are moments of genuine verve and moments of tedium, and that extends to the camerawork as well. Director Thomas White, who never made another film, will intercut New-Wave-ish jags of zooms and jump cuts with seemingly thoughtless medium shots. It’s messy. It’s meant to be. The film is helpfully jolted by a tremendous score by Ornette Coleman, playing with drummer Charles Moffett and bassist David Izenzon, a trio that first appeared on Coleman’s stellar Town Hall, 1962 album, a turning point before an abrupt career hiatus. That trio (featuring an appearance by Pharoah Sanders) recorded a score for Conrad Rooks’ 1967 film Chappaqua, but it wasn’t used for fear the music would overwhelm the imagery. 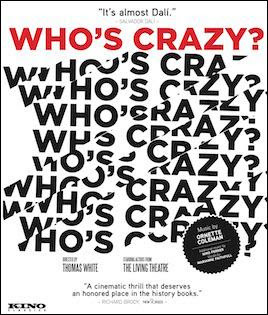 In Who’s Crazy?, that’s a welcome sense, the unpredictable jags of Coleman’s bold playing lending vital energy to a film that would likely become enervating without it. Once thought lost, Who’s Crazy? is out on an improbable Blu-ray release, sourced from a French print that includes burned-in French subtitles. (Dialogue is fairly minimal for long stretches.) The elements are in pretty rough shape, with plenty of dropped frames and moderate to heavy wear, and the grayscale image is flat, with not a ton of detail. Considering the provenance, it’s plenty watchable. The 2.0 DTS-HD Master Audio soundtrack has persistent noise and diminished dynamic range, but is a decent showcase for the score, which I’m now determined to track down a recording of. Extras include a Q&A with White after a recent re-release screening at Lincoln Center, where he seems a little surprised but grateful about the attention the film is receiving, and a 1966 television episode about this iteration of the Ornette Coleman Trio. A booklet essay by Adam Shatz offers some good context on Coleman’s artistic pursuits at the time. 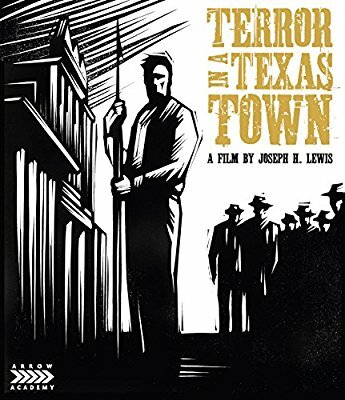 The title does no favors to Joseph H. Lewis’ Terror in a Texas Town, a stultified western that seems to yearn to swim in pulpy waters, but can’t quite allow itself to do so. There’s a germ of structural ingenuity in the film’s set-up, which launches into a climactic confrontation, one character’s monologue almost egging on the viewer’s own bloodthirst, but the film quickly settles into a more measured, straightforward approach. Written by a pseudonym-employing Dalton Trumbo, the film stars Sterling Hayden (whose Swedish accent is not passable) as George Hansen, a man who discovers his father has been murdered under what he’s told are mysterious circumstances. The film itself isn’t so coy — it plainly details how the lecherous McNeil (Sebastian Cabot) is willing to do whatever it takes to force out landowners so he can grab the area’s oil, and he uses henchman Johnny Crale (Nedrick Young) to do the dirty work. Hansen’s father was a whaler, which is just about the only piece of biographical information that matters here, as it provides a reason for Hayden to use a massive harpoon as his weapon of choice. Like the title, this sets up expectations that the film doesn’t really meet. Arrow’s 1080p, 1.85:1 presentation is sourced from a new 2K restoration, and is very impressive, particularly for a B-film like this. While inserts of stock footage have a smeary softness, everything else is tack-sharp and finely detailed. The depth of image is consistently impressive, and it retains that even in moments of damage — a couple marks and frame judders here and there. The uncompressed 1.0 mono soundtrack is a little flat, but doesn’t have any obvious issues. The transfer certainly makes Arrow’s release worthwhile, and the extras help foster some appreciation. Scholar Peter Stanfield contributes both major extras, offering an introduction that mostly repudiates any notion of Lewis as an auteur and offers some context to the film’s place among the HUAC blacklist controversy. A visual essay examines Lewis’ visual strategy, which Stanfield basically describes as deliberate but meaningless. A theatrical trailer is also included.